Thank you so much for registering for our event(s). Our goal is to help you find the perfect homes for your dogs. We appreciate all you do and are honored to be of assistance. It is only necessary for you to register with us once. If any of your information changes in the future, simply email us and let us know. We require a veterinarian reference for each rescue at least once a year. Since we check these for our adopters, we feel it is also important to do so for each rescue. We will send you the release request once you've registered. Our events host approximately 50 dogs, give or take. Rescues can attend by invitation only. At this time, all rescues will be required to bring their own crates to our adoption events unless otherwise arranged. We will supply the locations, tables, volunteers and hopefully many adopters. We'll promote the event and your dogs as much as possible prior to the event. We will pre-screen and interview your adopters (if you would like). We will offer follow up home visits with your adopted dogs. We're here to help you! If you have any questions or need additional information, please feel free to contact us directly. Thank you for trusting us with your dog's future. Please click the link below to fill out our registration form. Thank you for joining us for our upcoming event. We are very excited to be able to help you find the right homes for your dogs! There is a lot of information we need from our rescues regarding their dogs to make this event a success. All rescues who are coming to our events must have their own CT Animal Import License. All dogs coming from out of state must be spayed or neutered prior to the event. 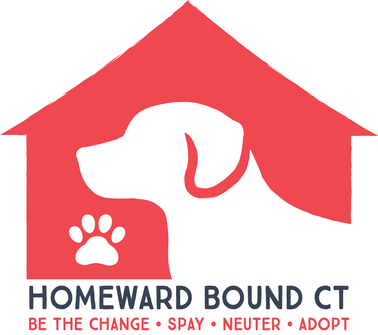 All CT dogs must be spayed or neutered prior to an adoption. All dogs must have their rabies vaccination certificate. The form below shows other vaccinations we recommend before coming to our event. At this time, all rescues will be required to bring their own crates to events. Please be prepared. Once you've completed registering your dogs, we will email you with information on downloading photos of your dogs to our site. We ask that you name all the photo files with the rescue and the dogs name, i.e. hbctfluffy.jpg (Homeward Bound CT Fluffy). If you need assistance, please feel free to contact us and we'll be happy to help you. Please fill out the form below to get started on registering your dogs. In order for us to start promoting your dogs on our website, adopt a pet, and Facebook page, we ask that you please fill out our new Dog Bio Form as soon as possible.